This week’s Boston Marathon bombing was a life changing event for all those who witnessed it. It completely caught us off guard and denied all sensibility. It was a horrible tragedy. It was an act of violence so heinous that it brings up all sorts of questions and causes people to respond in a variety of different ways. This Sunday’s passage, in the book of Acts, serves as a divine window for answering these two questions. 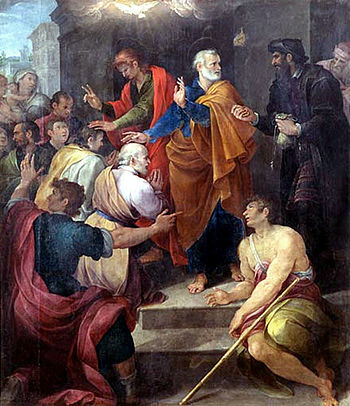 Saul, the zealous Pharisee, was responsible for the arrest and extermination of Christians in the early half of the first century. He was, no doubt what we would call today, a terrorist. I believe we can see, in the way God and others dealt with Saul, some hope for our present world and how we might respond to events as senseless as the marathon bombing. Join us for worship on Sunday morning at 10:30 and for prayer and Christian Formation classes at 9:15. After a break for Holy Week, we return to our series on the Acts of the Apostles, where we the see the church continuing to grow in both numbers and geography. The persecution by Saul and the Jews has not beat the church down but rather has served to bring the good news about Jesus to thousands and thousands of others. This was not the intent of the persecutors but, as always, God makes good out of the evil intentions of others. Luke, the author of Acts, also continues to reveal the actions of individuals within the church, as God utilizes them to display His greatness and power and to accomplish His sovereign plan of redemption. I love how Luke doesn’t just tell us about the nice things that happened. He tells us how it is. Which is often how it is in our day. He could have merely ended the account of Philip’s conversion of the city of Samaria at the verse that reads, “And there was great joy in that city” (Acts 8:9). But Luke didn’t do that. He continued to tell us, as Paul Harvey would say, “The rest of the story.” He reports on what happened in the midst of that conversion story, through an encounter with an acclaimed magician by the name of Simon. Prior to Philip, Simon had mesmerized men and women of all statures by his amazing feats. So good was Simon that he was referred to by the people as “Simon the Great.” He was even assumed to have, as Rush Limbaugh says of himself, “talent on loan from God.” Philip’s arrival, however, was a game changer and now it is clear who is truly great, and it is not either Simon or Philip. Rather it is God. Our own relationship with God is based on His greatness and power. Through Christ and the Holy Spirit we have communion with God and it is in that power that we begin to understand that He is truly great. That said, there are a few warnings in our passage that should make us stand up and take notice of our own relationship with our God, and that will be the focus of our journey through Acts this week. As we learn to live in a right relationship with God, we will begin to be amazed and take heed of the awesome majesty of our Lord.